In the two spaces of the Espace d‘Art Contemporain Paris, the performance and installation artist Simon Beer who lives in Paris and Zurich presents his newest work. «Dear Diary: At last I‘ve found time to use you. Everything has happened so fast and furiously that I can hardly believe I‘m really on my way around the world!» The diary on which the exhibition title is based was written by the well loved toy of every girl – or at least of very many girls living under western capitalism. Barbie, the light-skinned, long-haired blonde, that elegant charming creation, simultaneously an objet du désir, was lucky enough to win a trip around the world. «Dear Diary» a Mattel product of 1965 consisting of an accompanying brochure with diary notes by Barbie and 21 View Master images presenting the most important stops on the fantastic world trip undertaken by Barbie and her family, is an objet trouvé by Simon Beer that within the framework of this exhibition has been staged to form a walk-in installation. The second, immediately adjacent space is peopled with a photographic picture gallery (Cibachrome on aluminum) documenting picturesque highlights as the doll family conquers the world. Thus, for example, the Matterhorn is climbed, in Egypt the pyramids are taken over, in Holland the windmills admired, and in Paris a fashion show is visited in which Barbie, the happy, can also herself take part as a model. 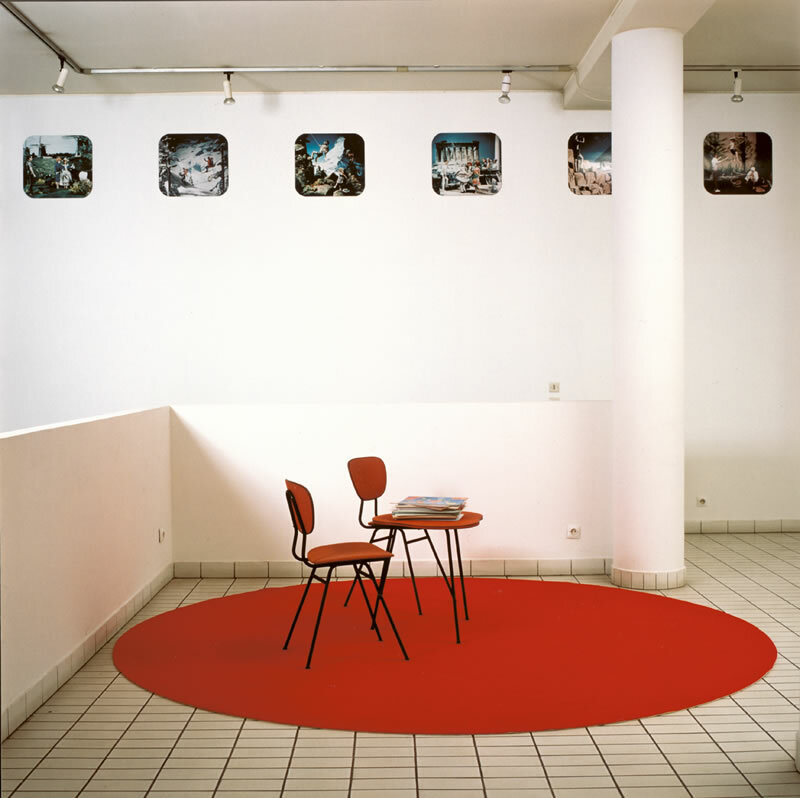 Once having absorbed the atmosphere of this joyous live, the circular red surface of the carpet invites the observer to take his or her place on the club table‘s group of chairs in order to leaf through the vacation travel brochures presented on the table thus delving into their own blissful imaginations and wishes. 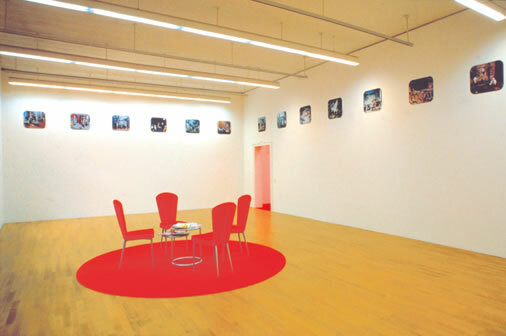 Kunsthalle Winterthur, 2nd space. Group of chairs with travel brochures, photographs hung approx. 50 cm below the ceiling. C-print on aluminum, 50x50 cm:	«May 27 Cairo, Egypt. (…)». 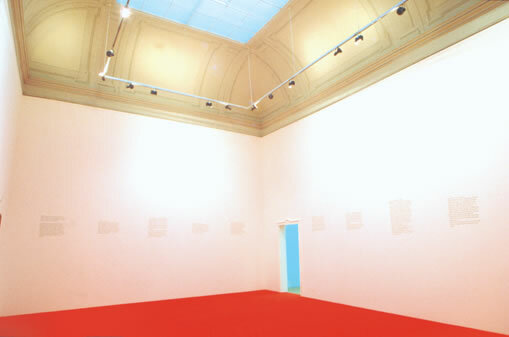 Kunsthalle Winterthur, large room carpeted in red, black transfer lettering placed approx. 75 cm above «normal hanging» height, e.g. : «May 27 Cairo, Egypt. 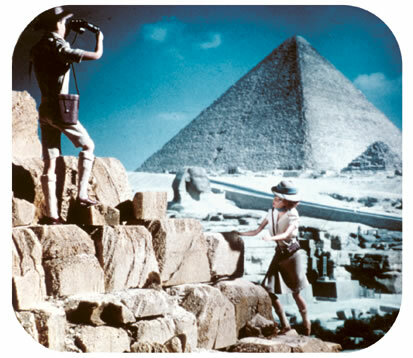 I dreamed of deserts, pyramids, and camels as we entered this ancient country…». Red carpet, transfer lettering, 21 texts, 21 photographs (Cibachrome) on aluminum, Barbie World Tour 1965, group of chairs, travel brochures.